Putts Fore Mutts Charity Golf Scramble! Tickets go on sale later this week! 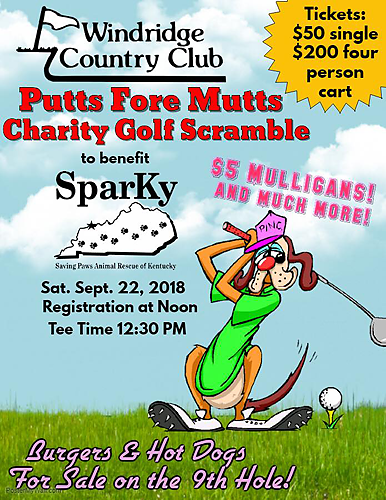 Comments Off on Putts Fore Mutts Charity Golf Scramble! 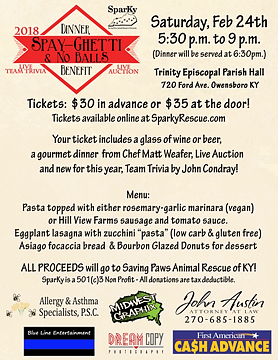 Comments Off on Spayghetti & No Balls Dinner Benefit is this Saturday February 24th! Fundraising for SparKy Superstar Chloe! Comments Off on Fundraising for SparKy Superstar Chloe! Cagney is the WBKR Pet of the Week! Tune in tomorrow morning at 8:20am to 92.5 WBKR to hear more about this sweet girl! I am already spayed, up to date with shots, good with kids, and good with dogs. Cagney is a Australian shep/beagle mix. She is 16 wks old and will be medium size when she is grown. She is not housebroken but working on it. If you are interested in any Sparky pet, please go to our website www.sparkyrescue.com, click on the adopting tab and fill out our pre application. Comments Off on Cagney is the WBKR Pet of the Week!